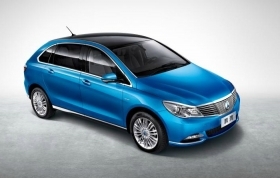 Daimler and BYD in China produce an electric sedan under the Denza brand. Daimler and BYD plan to expand their cooperation to bring new EV models to China as the market seeks to phase out fossil-fuel powered vehicles. BYD is discussing more investment in Shenzhen Denza New Energy Automobile, its 50:50 venture with Daimler, BYD's founder and chairman Wang Chuanfu told a group of reporters in the southern Chinese city on Thursday. The two automakers are working together to add more models under the Denza brand, Wang said, without elaborating. Currently the marque sells just one model, a five-seat sedan. Denza has been unprofitable since 2014, the year the model hit the market. The EV maker, backed by Warren Buffett, is among companies preparing to benefit from a surge in demand for the non-polluting vehicles as China prepares to set a deadline to end production and sales of automobiles powered by gasoline and diesel. Besides policy incentives to promote sales of the cars, authorities will also study measures to ease curbs on foreign investment in new-energy vehicles, a commerce ministry spokesman said Thursday. Daimler has partnered with BYD to produce and sell electric cars under the brand Denza since 2012. BYD said in May it will increase the 500-million-yuan ($76 million) investment in the joint venture, with a matching contribution from Daimler as well. Like Daimler, automakers including Volkswagen Group have also partnered with local manufacturers, allowing them to put off setting up their own production lines from scratch. A report on Wednesday said China is discussing a plan to allow foreign carmakers to set up wholly owned EV businesses in a major departure from current rules which demand that they work with a Chinese counterpart. BYD led makers of greener vehicles in the first seven months of this year, delivering 46,855 electric and plug-in hybrid cars, according to the China Passenger Car Association. Beijing Electric Vehicle, the EV division of state-owned BAIC Motor, followed with 36,084 units. By comparison, General Motors has sold 738 cars that run on electricity since it introduced the Velite 5 plug-in hybrid model at the Shanghai auto show this April. To help reduce reliance on fuel imports and curb emissions, China has been rolling out various incentives to help speed up adoption of electric vehicles. Regulators are poised to unveil a policy that will require automakers to earn enough credits or buy them from competitors with a surplus under a new cap-and-trade program for fuel economy and emissions. An official said Sept. 9 that the government is working with regulators on a timetable to end sales of internal combustion engines. France, the UK and the Netherlands are other countries that have announced similar moves. Predicting China will likely order an end to sales of all polluting vehicles by 2030, Wang said BYD is considering supplying batteries to competitors as the industry faces production challenges during the switch in powertrains and also exploring joint investments. The company expects to announce the first contract by the end of the year, he said. "We are talking to a lot of automakers on selling vehicle batteries and we have a big plan for that," said Wang. "I am sure it will be a big business for us in the future."